The two trees in the picture above have some issues. The one on the left was planted in early winter in my neighborhood. That in itself is not a problem – hardy woody plants and perennials can be transplanted any time in winter that the soil is workable – that is, not frozen and not too wet. This winter there have been times when the soil has been frozen but certainly not continuously and there were some good opportunities for planting. The trouble lies in the gap you see between the original root ball and the side of the new planting hole. A freezing spell has pushed the root ball partly out of the hole. This is called “frost heaving”. It’s not good for the root flare of the tree to be too much higher than the surrounding soil, though having it a little too high is better than having it too deep. The root flare is the topmost point where roots start to flare out from the trunk. There is also an air pocket around the roots which can hinder root growth, moisture uptake and tree stability. 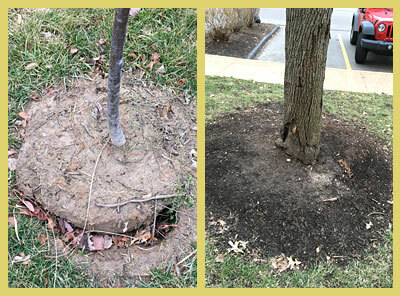 A good course of action for this tree would be to try to push the root ball back in the hole if possible (while not compacting dirt too much), to fill any gaps with dirt and to apply 2 to 3″ of mulch around the tree to regulate temperature extremes around the planting and retain moisture. Moisture level is especially important in the first 2-3 years after planting. If mulching isn’t done correctly however it could cause the problem that the second tree on the right is suffering from. The tree on the right is in front of my bedroom window. I’ve lived in my condo for 12 years and ever since I moved in this tree has had a “mulch volcano” around it. Mulch around a tree should not touch the tree trunk or be piled up around the trunk. This tree produces beautiful white flowers in the spring and I will miss it if it has to be removed. It might be doomed because during this past year the bark has been cracking and peeling off, a sign that it’s dying. Am I certain that the “mulch volcano” caused whatever the problem is? Not 100% because the disease has not been diagnosed, but since this practice is well known to cause death to the inner bark layer (cambium) or cause myriad other problems I recommend you avoid it. Trees can be mulched all the way out to the drip line or beyond if you want, and if you do that they may grow up to three times faster because they won’t have so much vegetation (like grass) to compete with for nutrients. The mulch must not touch the trunk – keep mulch several inches away and make your mulch resemble a donut rather than a volcano! 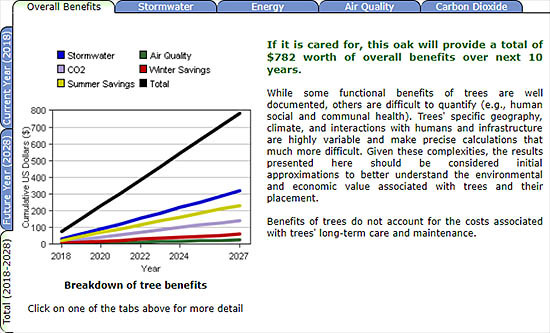 I hope you can protect your investment in trees by avoiding these commonly occurring issues!